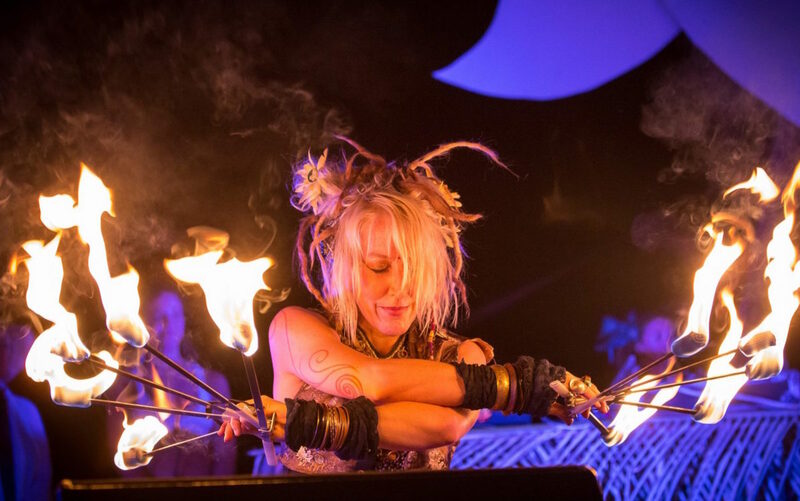 Onamare Heart, aka OnaRay has emerged into the world of performance art by utilizing a multi-faceted array of skills from mythological storytelling, ritual dance, circus acrobatics, stilt walking, aerial artistry, and theatrical fire art. She has studied with well-known circus coaches across the globe. She engages in performances that move beyond just entertainment, but hold purpose with intent. The purpose for her is two-folded, one to spark a transcendent experience that feeds the human story and the other to push the edges of cultural perception and human disbelief. She has always loved to dance, start creating skits in her livingroom as a early child, took Jazz and Modern Dance classes at age fifteen for many years. Starting yoga at age 21 and pole dancing in her mid-twenties and aerial arts in her 30's. Then, she discovered acro yoga/ partner acrobatics that has taken over her life the past 4 years. She has never stop training or exploring more movement inside. She nows teaches, performs, and loves to move in ease with joy!